For 2010, Ben Heckendorn and his forums members return to make the benheck.com experience even better than 2009! Project reveals and discussion, real time modding and even the ability for show-goers to bring their own consoles to be modded by benheck.com regulars will be available as the benheck.com Experience moves into it’s own room and they throw out all of the rules about how your console or controller needs to look. It’s time for another podcast! Yes, we haven’t been keeping up the normal 2 week schedule but hey, there’s a lot of stuff going on, and we don’t get paid to do the podcast, so unfortunately it sometimes becomes a backburner item. Plus an awesome contest, in honor of Mega Man 9 –Design the lamest Mega Man villain robot ever! Must include artwork, the primary weapon and their main weakness. Bonus points for making an 8-bit accurate “pixelated” version. Even more bonus points for using an existing item ending in “man” as the name. Such as “Congress Man” (prints money to shoot at you) or “Leslie Man” (emits vomit on Steve Carrell). Contest ends upon publication of the next podcast (roughly 2 to 3 weeks). 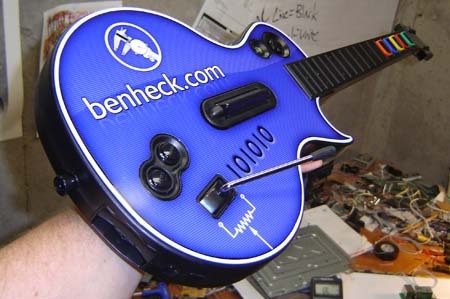 The 2 best entries will win a Guitar Hero III wireless guitar with a custom Benheck.com faceplate! I have a bunch of these left over from the foot pedal project, so I figured why not unload a few? You can even choose Xbox 360 or PS3 version! Email your entries using this link. Good luck and enjoy! Musical scores in movies – they aren’t good or memorable anymore. We need Jerry Goldsmith back! The cost of Blu-Ray discs – too much! Hollywood’s dwindling box office – what we think are the real reasons even though they’ll blame it on gas prices at year’s end. Wanna see more? Check out Engadget.com! 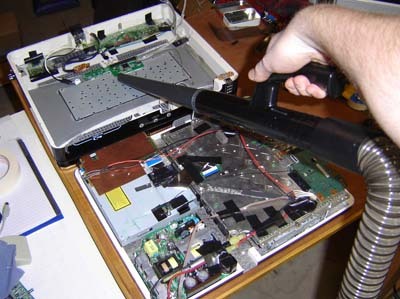 Original 60 gig PS3 model with backwards compatibility. 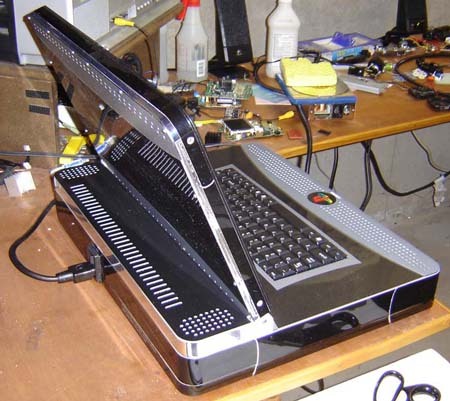 Built-in keyboard and stereo audio amplifier. 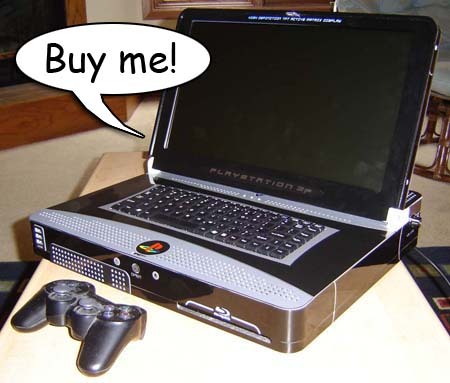 Measures 17″ x 13.75″ x 3″ (actually thinner than a stock PS3) and weighs 16 pounds! You can view more photos on the main story page at Engadget.com. In the coming weeks the “Making Of” articles will follow. This unit was built by their request and is intended to be auctioned off for charity – more details to come. Since I am already busy with other things, I will not be making any more of these. Feel free to email and ask for other custom design work or inquiries, however! It’s always good to get the pesky Dremel Dust out of new projects before you finish them up, wouldn’t you agree? Snag some cheesy benheck.com merchandise! At long, long last I have set up a Cafepress store in which curious visitors and fans can order some benheck.com branded stuff. Click here to have a gander. For those of you tossing and turning at night, worrying that you would never be able to buy a “Get in there!” t-shirt, you’ll be glad to know that the nightmares are over. We’ll update every so often with new designs as time permits. In other news, should have some cool new projects and stories coming up this week, stay tuned!